While the well-coiffed Marie Antoinette was telling the starving peasants of France to eat cake if they had no bread, the French populace was reeling from two spendy wars and several years of bad harvests. The lavish lifestyles of both the aristocracy and clergy of the times had led to discontent and a call for reform that landed many protestors and dissenters in prison- the most notorious of which was housed in the medieval Parisian fortress known as the Bastille. Considered the flashpoint of the French Revolution, the storming of the Bastille (which only housed 7 prisoners the morning of July 14th, 1789 when it was attacked) is a day to celebrate the rise of nationalism and democracy in France. If you or other Francophiles are looking for an opportunity to break out the champagne and baguettes, be sure to include these perfectly Parisian pairings of flowers to add a little n’est-ce pas to your Bastille Day celebrations. What could be more perfectly French (or perfectly at their peak in July) than lavender. There are several different kinds of lavender available from florists and farmer’s markets this time of year, but true French lavender is Lavandula stoechas and is a great buy as either a cut flower or as a live plant to be planted in the perennial garden afterwards. Besides the wonderful, soft fragrance and showy purple wands of this flower, another benefit is that it can be dried and placed in a sachet or little bag to scent a closet, drawer or room. 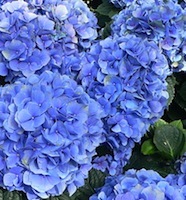 Like lavender, there are several different kinds of hydrangeas available through florists and garden centers, but few are as classically lush as the French hydrangea (Hydrangea macrophylla). Native to the south of France, but extremely popular next to the moss-draped trees of the deep south in the US, just one stem of these blue, white or pink clustered blooms will fill a vase with a certain joie de vivre. Consider getting one of each color for a pastel version of the French flag. Marie Antoinette ended the revolution without her head, and you’ll simply lose yours over the dazzling diversity of irises. 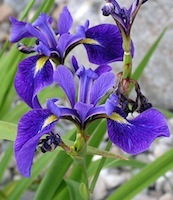 The one native to France that can still be seen growing wild on the countryside is Iris pseudacorus. It is most commonly found in yellow, but try to find the true blue and white cultivars of this appropriately named flag iris to wave around while screaming “vive la france” this Bastille Day.